Trombone Shorty & Orleans Avenue - Otter Productions Inc. | Otter Productions Inc. Trombone Shorty & Orleans Avenue - Otter Productions Inc.
Called “New Orleans’ brightest new star in a generation” by NPR, Trombone Shorty (aka Troy Andrews) has rocketed into the public eye over the past few years. Recent career highlights include closing the New Orleans Jazz Festival, appearing in a Lenny Kravitz documentary, releasing the acclaimed “Say That to Say This,” regular appearances on the acclaimed HBO series, “Treme,” and stopping the show at last May’s Avila Beach Blues Festival. He tore it up! JUST ADDED – THE RECORD COMPANY… Killer! The Grammy-nominated musician and his band, Orleans Avenue, know how to get a crowd going with their infectious, high-octane blend of tight funk, jazz-rock and slinky R&B – or, as they like to call it: “Supafunkrock.” An “unstoppable force” (The New York Times) in today’s music scene, Shorty brings all the rock star swagger with serious chops to back it up. Get ready for a brash and bold music party right here at our very own SLO PAC! 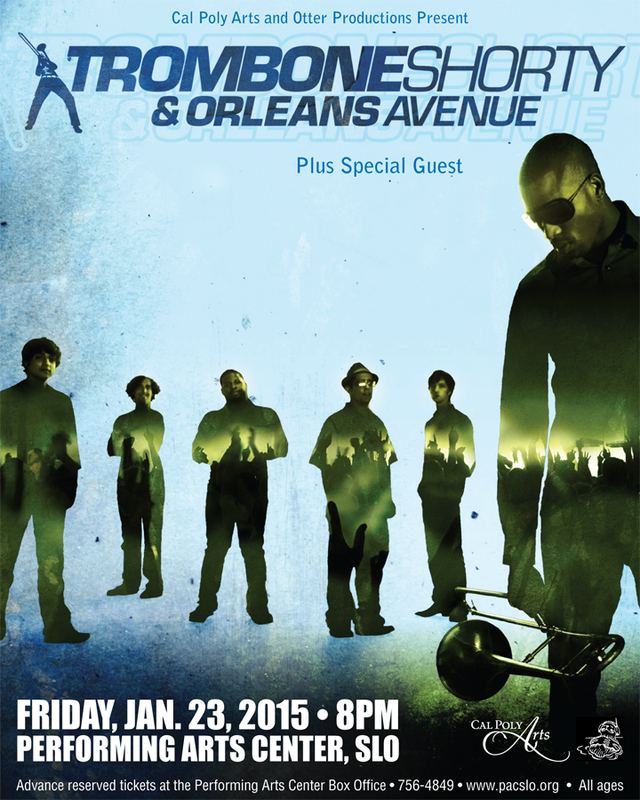 Trombone Shorty & Orleans Avenue plus very special guest at the Performing Arts Center in San Luis Obispo, Friday night, January 23rd, 2015. Tickets will go on sale to the general public on Friday, November 21 at noon. The Performing Arts Center is on the Cal Poly Campus at One Grand Avenue, SLO. For advance Reserved tickets please visit the PAC Box Office on the Cal Poly Campus, call (805) 756-4TIX (756-4849), or order on line at: www.pacslo.org. All Ages. Advance Reserved tickets available on the Cal Poly Campus at the PAC Box Office; charge by phone at (805) 756-4TIX; order on-line at www.pacslo.org.